Do you love flowers? Are you a keen gardener? Or perhaps you just enjoy arranging cut flowers in your home. 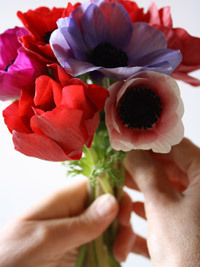 Then creating your own unique DIY wedding flowers could be the perfect wedding project for you. But before you embark on such a big task, however confidant you are take time to read through some of my top tips. If you are lacking ideas or if you prefer to have you hand held a little bit then I hope this advice will help you along the way to creating your perfect DIY wedding flowers. When I sit down with brides to discuss their wedding flowers the first starting point is normally always their wedding color theme, this is often based around the color of the bridesmaids dresses. So start by thinking about the color palette of flowers you will want in your bridal bouquet and your bridesmaid’s posies. 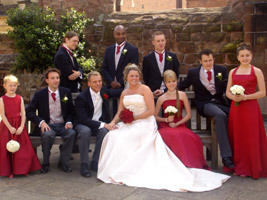 I often incorporate a small amount of the bridesmaids color into the bride’s bouquet. For the bridesmaids I often advise using a color that will stand out in front of their dresses. Once you have decided on your colors now you can set about choosing your flowers, making sure your choices are available in your colors. Flowers that are relatively easy to work with are tulips, roses, chrysanthemums and gerberas. The great thing about all of these flowers is they all come in a wide range of colors. If you are an experienced flower arranger you might want to think about using freesias, orchids, hydrangeas, peonies, anemones and lilies. Make sure you check that you’re chosen flowers are available during the time of your wedding. Some flowers are more restricted by seasonality than others. For example roses, gerberas, lilies and chrysanthemums are available all the year round. Whereas tulips are a winter and spring flower, some types of orchids are not available in the summer and likewise peonies are a spring and early summer flower. I always work with seasonal flowers for two simple reasons, quality and price. If you stick to using seasonal flowers they will be of a really good quality and not break the bank, out of season flowers can cost up to three times more! It’s also really nice to have flowers that match the time of year of your wedding, as it looks far more natural. Now you need to get ideas together for the shape of your bouquets, table centerpieces etc. But be realistic, don’t go picking complicated designs that have obviously been made by a talented florist you will only make life too complicated. Simple designs that are easy to construct can still look absolutely stunning. One way to keep things simple is to use a mass of one or two flowers this gives you a bold statement of color and a stunning impact to your arrangements. It will also help to keep your costs down because the more flowers you order in one type will allow you to buy them at a better price. 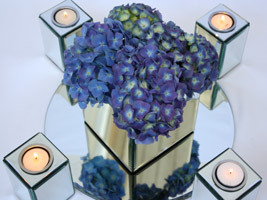 In the photo above you can see how I have added a mass of blue hydrangea flowers into a mirror cube vase to create a low wedding centerpiece. This has to be key, I can’t stress enough how this single factor will make your DIY wedding flowers successful. 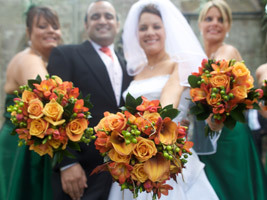 You will need to practise each element of your wedding flowers months before your wedding. This will give you time to try out designs and build your confidence. If you are not actually going to be doing them but your mum or friend are, make sure they practice them so that you can see what they are going to look like before the big day. This will take the pressure off you, as you’ll know that everything is going to look exactly how you had imagined. When working with flowers there is not a lot you can do months in advance apart from working out a detailed schedule so that you know how much time you are going to need. You can also make a list of all the items you will need including vases, ribbon, wires etc and place your flower order! Although I work on wedding flowers all the time I still carry out all of the points above, you just can’t afford to leave things to chance, the better organised you are the more you will enjoy creating your own unique diy wedding flowers. "Everything was excellent, couldn't have asked for more perfect flowers or a better service!"